Former British intelligence officer Jonathan Pine attempts to infiltrate the entourage of Roper, a sinister and powerful Englishman responsible for fitting together the pieces for a monumental arms-for-cocaine deal. 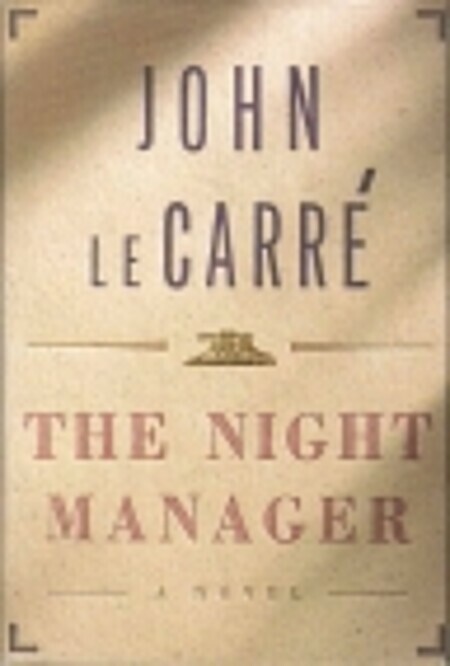 Is "The Night Manager" up to the best of John le Carré? The equivocal answer has to be: yes, but only where it concerns the worlds of Roper and the London and Washington agencies. Their activities are handled with total assurance and an evident and infectious enjoyment. Elsewhere, however, Mr. le Carré sometimes surrenders to the inescapably sensational nature of the espionage thriller, and also to a romanticism about women that leads to the creation of a pipe-dream fantasy rather than a character in Jed, Roper's mistress. In his superb new novel […] he works familiar territory with the mastery of a brilliant conductor returning to a favorite symphony. […] Through every page, the almost-numb heart and mind of Le Carre's still- honorable protagonist give this novel a heartbreaking gravity. The Night Manager also obeys solid and readable conventions. […] But in seeking to move with the times, Le Carre has produced an adventure of the most old-fashioned and predictable sort. […] Hovering over this extravagant saga is a moralising, allegorical tendency that continues to drain the energy out of Le Carre's natural storytelling gift. When the Berlin Wall came down, and the Cold War ended, many people speculated what the future would hold in store for writers of spy fiction. John le Carre had established himself at the forefront of that genre, and critics waited with considerable interest to see how he would react to the changed times, and the virtual removal of his literary context. 'The Night Manager' was his first novel to be published in the post Cold War era, and it demonstrated that he wasn't particularly worried about adapting to a new agenda. The book bears all the hallmarks of his previous works: that extraordinary prose style that no-one has ever managed to emulate but which seems to flow so naturally and effortlessly for him, the air of despair encompassing his leading characters and a close attention to detail that always lends his novels such a depth of verisimilitude. The protagonist, the night manager himself, is Jonathan Pine, a former soldier with more than customary amounts of career and family baggage, who has ended up working at a luxurious hotel in Zurich where he presides over the night shift. His attention is caught when Richard Roper, an immensely wealthy international tycoon, descends upon the hotel with his considerable retinue at short notice in the middle of a protracted blizzard. Pine has encountered Roper before and has a grudge to resolve. As the novel unfolds as Pine embarks on an espionage mission to expose Roper's dubious operations, going under deep cover, with professional assistance. With the cold war over, LeCarre shows the bureaucracy and petty rivalry among the various American and British intelligence agencies. It shows that money rules and that there really aren't any good guys left. Complex, tense and, as is usual for Le Carré, futile, this book explores the internal life of a man drawn into the most dangerous of roles, a secret agent operating a criminal gang, and the personal conflicts that allow him to be drawn into this work. The psychological profile is Le Carré’s stock in trade, and he applies it adeptly in a new setting, making the story less of a typical spy novel and more a study of character and circumstance. It would be a misnomer to call the book a spy novel (as the term is commonly used in marketing), but in fact Le Carré’s preoccupation with this theme is probably truer to the actuality of spying than the action adventures that usually go under that name. But this has always been Le Carré’s theme, and he excels at it. The troubled characterization of the agent Jonathon Pine seems convincing enough, although internal verbalizing about his desire for the boss’s wife seems a bit overstated. Perhaps it is standing in for the passion that drives Pine – the reason he accepts such a role in the first place is his fury over the murder of another woman linked to the gang and his own propensity for uncontrolled rage. (But this is another recurring theme for Le Carré – men driven by an unattainable passion for a woman. Also as usual for Le Carré, the women’s roles are thinly sketched, primarily being just an object of interest for the male protagonists.) Pine’s passions underlay his military past, and carry him through the mistakes and betrayals to his heroic if unsuccessful achievements. Interesting here is how the betrayals that, in other Le Carré books come from conflicting national interests and organizations, here come from corruption, careerism and conflict within the British secret services. And equally bad is the way that the protectors of international law profess to be against crime, but turn away when commercial interests are at stake. In this scathing characterization, the internal conflicts lead to the destruction of good operators who try to protect honor and truth, and to the torture and near death of the agent Pine. It is one of the few (somewhat) happy endings in Le Carré’s books that sees Pine’s handler make a trade with an utterly venal and despicable criminal for Pine’s life. It’s interesting to see how the bureaucrats manoeuvre to gain and lose control, and how a principled operator tries to rescue his operation. This seems much more realistic than the spectacular technology and personal heroics of the trashy spy novels. A slinky international thriller about post-Cold War geopolitics, crammed full of damaged antiheroes, corrupt politicians, worn-out spies, megarich drug-runners and frustratingly vulnerable women. It opens in Zurich and rapidly expands to take in detailed sketches of Quebec, the Bahamas, Miami, the Netherlands, Central America and Cornwall – so that there is a kind of travelogue element to the action, not unlike the feeling in those early Bond movies where audiences partly just wanted to see someone jetting around the world. This world is not the world of Bond, though, or indeed that of le Carré's own earlier works – it is much murkier and more chaotic. It is harder to see who the bad guys are, since so many of them seem to be doing business with the good guys: a lot of high-up people are very willing to make excuses. ‘By vacuum, you mean peace?’ Goodhew suggested, not wishing in the least to sound censorious. At the other end of the chain from the dodgy-dealing senators and ministers, you have the foot-soldiers of this new criminal economy – a growing multinational population of disaffected specialists. American veterans sickened first by war and then by peace; Russian Spetsnaz, trained to guard a country that disappeared while their backs were turned; Frenchmen who still hated de Gaulle for giving away North Africa; the Israeli boy who had known nothing but war, and the Swiss boy who had known nothing but peace; the Englishmen in search of military nobility because their generation somehow missed the fun (if only we could have had a British Vietnam! ), the huddle of introspective Germans torn between the guilt of war and its allure. Attention here is on the forces of international law enforcement – those fighting arms and drugs trafficking, specifically – who have an uneasy, even adversarial, relationship with the ‘espiocrats’ of MI6 or the CIA who, in their view, are constantly asking them to turn ‘a blind eye to some of the biggest crooks in the hemisphere for the sake of nebulous advantages elsewhere’. The prose is typically efficient and controlled. His political understanding is very deep, his dialogue is outstanding, and lightning portraits of new characters are a joy: one man has ‘a face to play cards against and lose’, while the main female lead, Jeds (a public-school abbreviation of Jemima), is characterised by her ‘jeweled brilliance and a kind of dressed nakedness’. I love this line, but it's also a pointer to the rather limited role of women in the book: they are too sexualised and too disposable for my liking. Of course Jeds is the kind of young, hot arm-candy that very rich criminals really do keep around, and you could say her character is perfectly justified; but for me she wasn't balanced nearly enough by the rest of the female cast for me to feel able to enjoy it. I found this very disappointing – it's such a glaring hole in an otherwise masterful grip on characterisation. My first le Carre. Enjoyed it very much. Was a bit slow in the beginning. But awesome story. I was expecting a Bond-esque story. Now I know what to expect from a spy thriller. Bond doesn't do as much work as Pine. He is getting a lot done for him. Except maybe the shooting. Pine is just awesome. Also, now I know I have started expecting a lot from endings because of all the Hollywood movies. This book just pushes you back with a low-key ending. Kept me hooked to the story even when there were parts where it was very slow. For his own salvation Jonathan Pine becomes a secret agent and infiltrates the murky world of international arms trading. Brilliant characterisations, intelligent, cynical, well written and believable. Full of glamour and danger. With various strands of the secret services with their own agendas and language politicking in the background. Another strong entry. Also, started but didn't finish the BBC miniseries with Hugh Laurie before I read this; may go back and watch it now. The truth that your past will catch up with you is well presented by a master of the genre. Though I found the ending perhaps overly sentimental, compared to some Le Carre earlier works, this is still a fine way to spend a couple of evenings for the over-forty crowd. The young are too cynical for complete appreciation. This was the first John Le Carre book I've read and I'll admit it I read it partially because I knew there was a mini series coming out for it on tv. (which is pretty enjoyable fyi). Anyway, the book didn't grab me right away but it kept my attention for the first few pages until I was into it. The character of Jonathan kind of confused me when he met Jed. He's attracted to her but thinks she's a total idiot?? That didn't make sense to me at all. Jonathan seemed kind of flaky himself when it came to romantic relationships. Almost too knight-in-shining-armor like he had some PTSD that he never dealt with. And I thought the last couple of chapters were less than fulfilling- and abrupt. I would have thought the ending would have been much different than it really was.